2017 Escape takes a Denver entrepreneur from the city to the mountains for a high-tech, cliff-hanging adventure. The drive from downtown Denver to the Rocky Mountains takes only around 20 minutes, but in that brief period of time the sky has gone from blue to slate to blue again, before suddenly settling on an ominous black. I exchange a nervous glance with Jacqueline Ros, 26, who has agreed to let me tag along on a rock climbing exhibition with her and a few members of her team at Revolar, the startup she founded here in Colorado two years ago. Huge pellets of water begin to hit and bead up when looking through our 2017 Ford Escape’s panoramic windshield. We pull over to do a quick scan of the satellite weather patterns on the 8-inch color LED touch screen1, through the simple-to-use Ford SYNC 3®AppLink2, and we both sigh with relief: The rain will skirt the cliffs we’re heading toward. Good thing, since rock climbing on wet surfaces is one big dangerous nope, and Ros has been looking forward to the combination of physical release and meditative relaxation that climbing brings her. Not that Ros is complaining; she’s worked hard to get to this point. Her brainchild, Revolar, is a keychain-size device that pairs with your smartphone and allows the owner to program up to five contacts into it. If you find yourself in an uncomfortable situation (say, a first-date hike that’s turning awkward), two discreet clicks will send your GPS location to loved ones so they can call to interrupt the situation. Three clicks does the same but also triggers a red alert to send for help. “In my senior year of college I took a class on entrepreneurship and loved it,” Ros explains of her idea’s origin at the University of Florida. “It was about solving real-world problems with business solutions.” She also had a more personal reason behind the invention—her younger sister had been assaulted, and Ros wishes she could have helped. Revolar is a physical manifestation of that promise, ‘I’ll be here for you,’” she says. Revolar also has innovative tracking capabilities, which can be useful out in the wilderness. “I have a friend who went skiing with it and traced her whole route down the mountain!” Ros says. Once we reach the foothills, we begin a steep hike up toward some crags until we’re more than 6,000 feet above sea level, where the view is breathtaking. 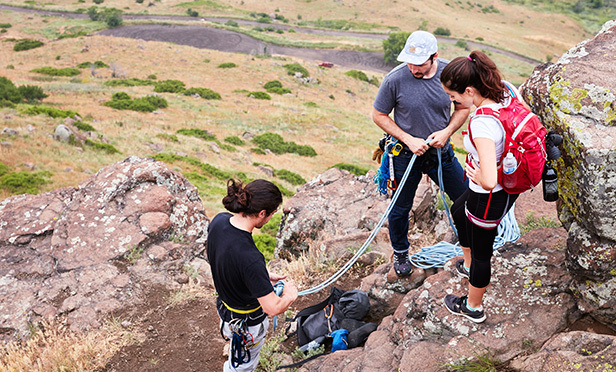 Birds of prey soar by at eye level while Ros and her friends secure ropes to existing bolts in the rock at the top of the cliff, using carabiners (metal loops with spring-loaded hinges). “Finding the right climbing partner is like dating,” Ros says as she slips into her harness and slides the rope through an attached gizmo called a belay, which will help prevent her from falling too far if she loses her grip on the rocks. Ros’ climbing partner is her friend Chris Ng, who is also the designer of the Revolar hummingbird logo; today they will take turns “belaying” for each other, standing at the bottom of the cliff and controlling the slack on the rope that’s holding the other person. A sudden explosion of chalk in the air—the result of a two-handed, overhead high-five between Ros and Ng—interrupts us. The move is their signal that they’re ready to start the climb. “You’re supposed to say something like ‘belay on’ or ‘climb on,’ but that’s boring,” Ng explains. The pair makes rock climbing appear effortless, and at one point Ros even swings from side to side high up in the air, a gleeful grin plastered on her face. Once she and Ng have worked up a sweat, we head back to the 2017 Escape. 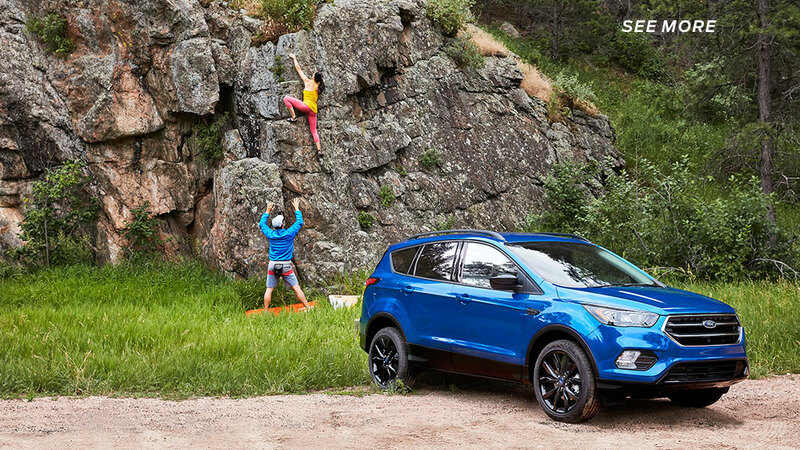 Concerned about how much gas we had in the tank, I quickly use the FordPass3 app to check the fuel level of our SYNC® Connect4 -equipped Escape as we walk back—it’s all good, thanks to its fuel-efficient Eco Boost® engine. At the start of the day, we had loaded several inner tubes along with the climbing gear into our Escape (an easy fit, since putting the back seats down provides a shockingly huge 68 cubic feet of space). The plan was to cool off post-climb by floating down Ros’ favorite creek, but today the normally gentle river has transformed into roiling rapids. Instead we settle for a riverside picnic. On the way there, the vehicle’s brilliant Auto Start-Stop Technology, included with available EcoBoost engine, kicks in and turns the engine off at every stop sign and seamlessly starts it again once my foot releases the brake pedal—a perk for drivers looking to reduce vehicle emissions.